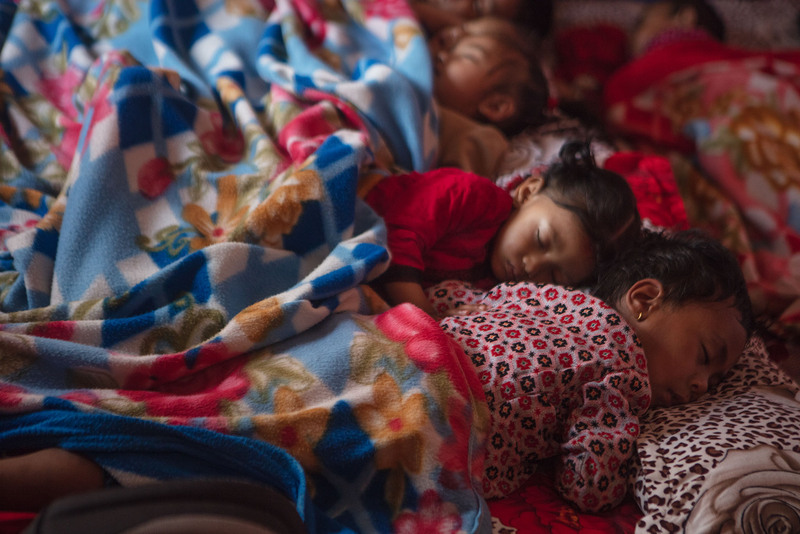 I just got back from one of the most unforgettable trips of my life, Nepal on ActionAid’s side. 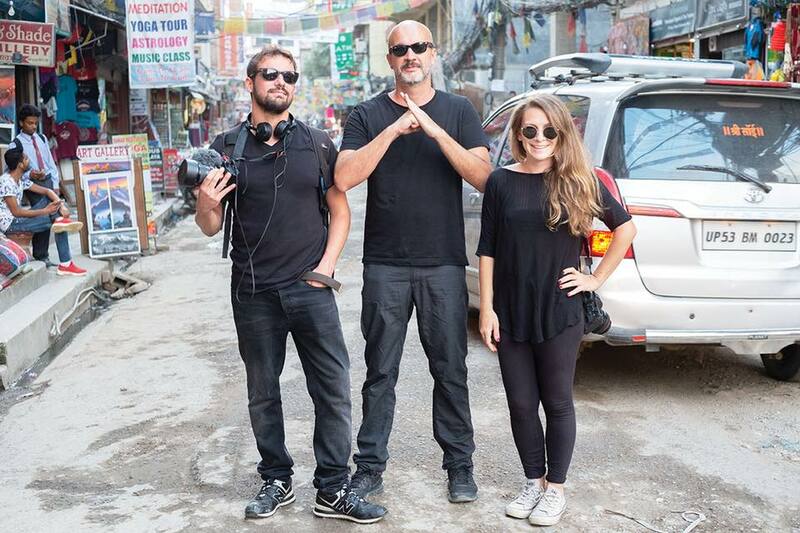 If you’ve been reading my blog for a while you know last year I went on a trip with ActionAid Italia to document violence agains women in India. That trip changed everything for me, it was a profound experience that made me understand that the direction I wanted to take wasn’t tourism anymore. From that day I decided that I wanted to travel telling stories of people and their community, stories of their difficulties and successes and the change we can bring anywhere in the world. I think it’s safe to say that ActionAid changed my life. This year trip has been different from the one in India. 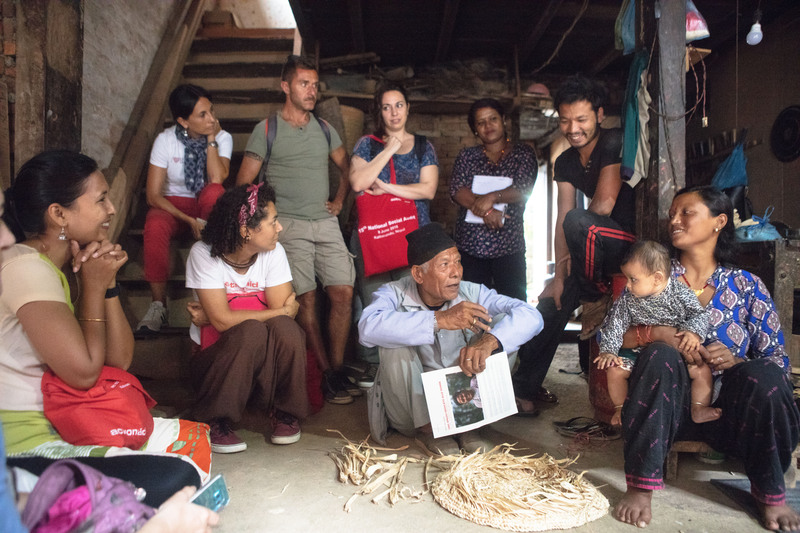 We traveled with 16 of their supporters—people that came from different parts of italy and all had different backgrounds, each of them sponsors a child in different countries, including Nepal—and together we visited the projects ActionAid has in Kathmandu, meeting the local communities supported also thanks to their child sponsorship program. We meet at the airport in Doha, I hug the ‘Team ActionAid’ and I meet my 16 new travel companions. In their eyes I see curiosity and different expectations. I’m there to tell their story, they are there to live it. There’s who came to look for answers, who to get rid of some doubts, who to understand a little more, but whatever the reason, they are all there to change a little piece of the future, to be part of something they don’t quite know what it is yet. We arrive in Kathmandu tired from the trip. In the afternoon we visit Durbar square. The smell of incense, the bells sounds, the women in line for the evening puja dressed in their beautiful sari, it all brings me back to India in an instant, but i look at the wooden temples, the Tibetan flags hanging everywhere and the much more relaxed atmosphere and I know for sure I’m in Nepal. At night we all meet for dinner and start getting to know each other, prepping for the week ahead. The next day the real trip begins. In the morning we meet the ActionAid Nepal’s staff that welcomes us with a ceremony. 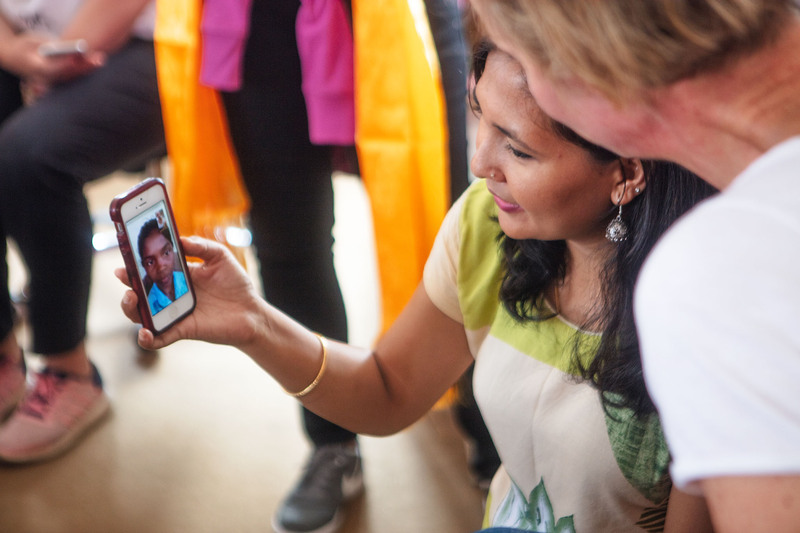 Thanks to them some of the sponsors are able to talk on skype with some of the kids they are sponsoring here in Nepal. The emotion in their eyes and their voice is indescribable, we all get emotional watching them watching the screen. Later the local staff explains to us the current condition of Nepal; they tell us that after the earthquake—that killed almost 9000 people and destroyed almost 600thousand building—the reconstruction is proceeding slowly, but things have definitely improved since 2015 an Nepal is ready to leave this story behind to tell new ones. New stories like the one about the women of the center we visit the following afternoon. They welcome us putting tilaka on our forhead (a red mark usually made of sandalwood that symbolizes purity). With the support of ActionAid these women got the opportunity to have a key role within the community in managing the reconstruction. Surprisingly, in its devastating drama the earthquake presented an opportunity for many women to come forward and claim back their rights and start being included in leadership roles that are usually reserved to men. 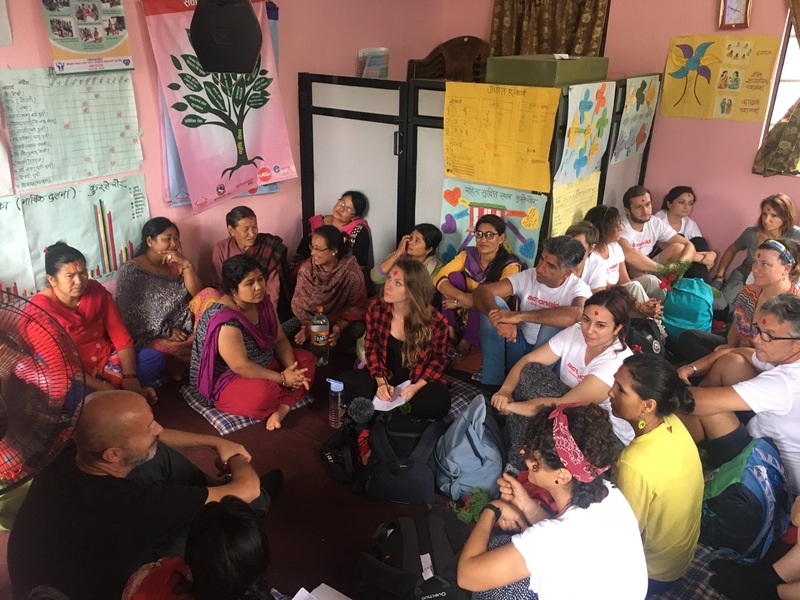 After the earthquake ActionAid intervened creating Women Friendly spaces, centers where women can meet to discuss their problems and support each other. Thanks to this centers now many women are not forced to stay at home anymore and are starting their own businesses that allow them to become economically independent and to fight domestic violence. Pabitra, one of the women sitting on the floor with us tells us her husband used to beat her and she lost her hearing because of it, but now thanks to the training and support from the center she can help other women like her to get out from the spiral of violence. 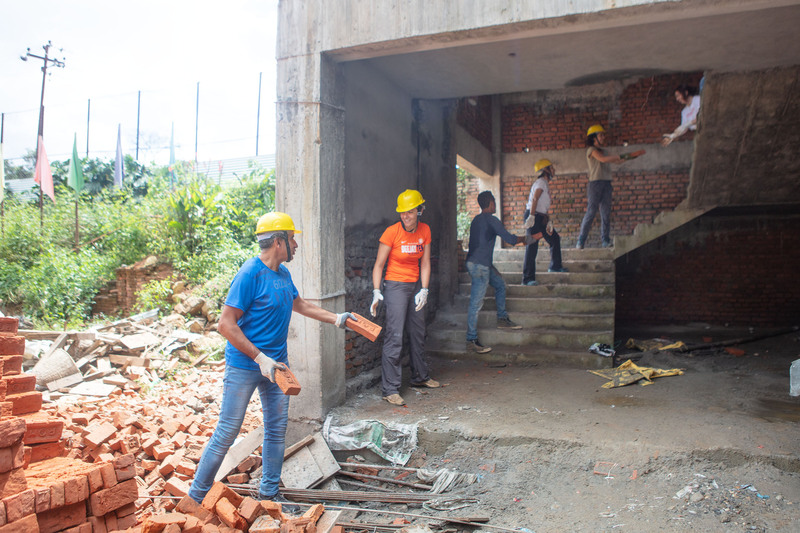 Over the following days the supporters roll up their sleeves and start working on the reconstruction of the Bani Bilas school in Chapagaun village, the school was partially destroyed by the earthquake. The kids observe us with curious eyes from the classrooms, and while they move bricks and dirt from one place to another, me and Alberto(the videomaker) document everything that goes on. The week flies by, during the day we visit the projects and at night we all go out together in Thamel, and among bricks and between a Gorkha and a Sherpa beer, new friendships are formed, existing ties get stronger and thoughts and emotions are exchange till late at night on the hotel balcony. 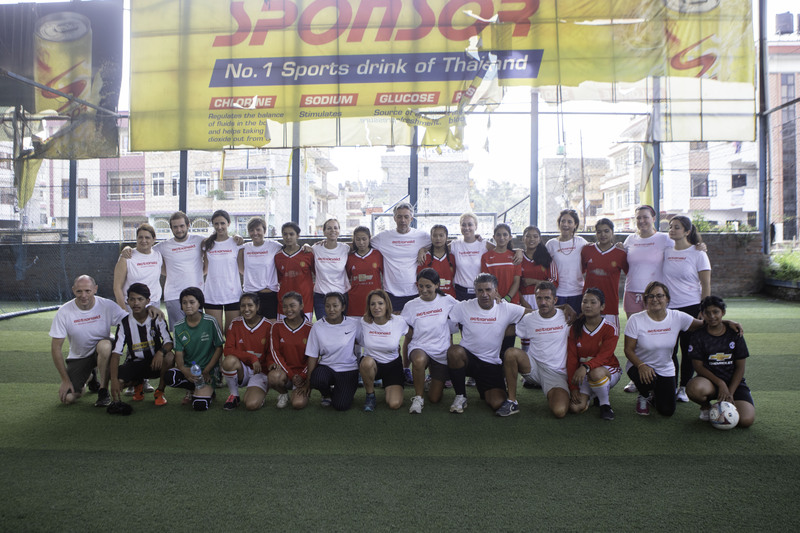 On Sunday there’s a soccer game: Nepal-Italy, the supporters against the girls of the Fusion Football Club of Manohara (a project started by ActionAid to fight gender stereotypes, where they organize football matches open especially to young girls and lower classes kids). The girls win 7-3! 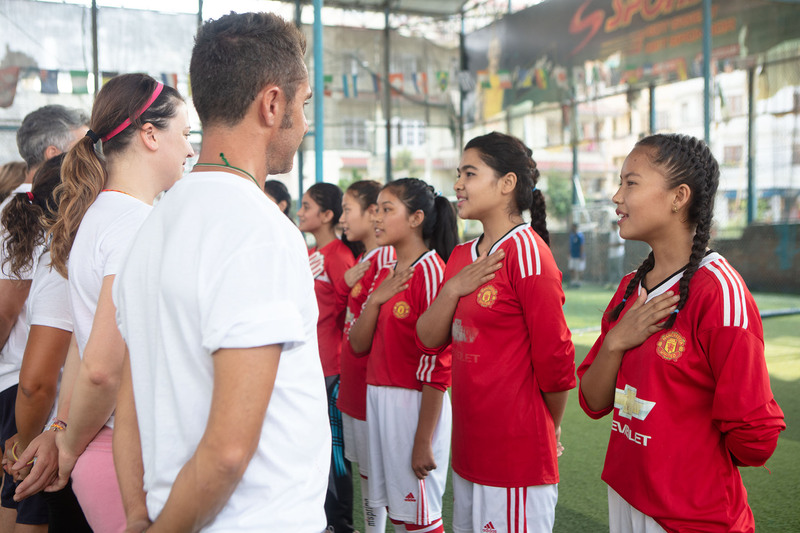 The soccer field is located in a wealthier area of Kathmandu, the streets are paved—which is rare—people in the neighborhood are well dressed and the houses are new. 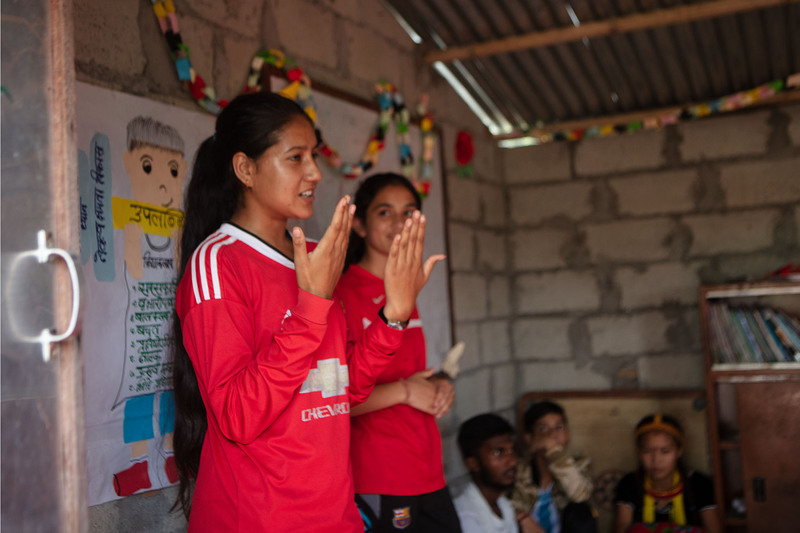 They tell us that where the girls live there are no spaces nor opportunities to let them play so the only solution is to bring them to this side of town where all the nice soccer fields are. In the afternoon there’s a moment that no one saw coming and shifts everyone’s perception. We get off the van and unexpectedly we find ourselves in the slums. I’ve been in the slums before, the first time in Bhopal with ActionAid. And though now I’m quite used to it, it’s never a light experience. For some reason, urban poverty is harder to digest than rural poverty for me. The conditions are more extreme, more degrading; tiny shacks made of sheet metal, open air sewer, omnipresent decomposing trash. You feel small and impotent in front of it, frustrated, even angry. When I think about all this I cross Francesca’s eyes…it’s easy to recognize that look, it’s the look of someone who just broke her heart, the same look I had in my eyes the year before in India. While we walk towards the entrance, suddenly the air around feels heavy, no one talks, I see Francesca’s look in many other eyes. Reality looks very different when seen in person instead than through a screen. In times where NGOs are stigmatized and constantly under attack it has become more and more common to look with suspicion to those who just want to help make this world a little better. But just by looking into these kids eyes you could realize how important the support given to them is and understand the impact of the work done here. Like Bourdain always said, I see people that are doing the best they can in very very difficult situation. 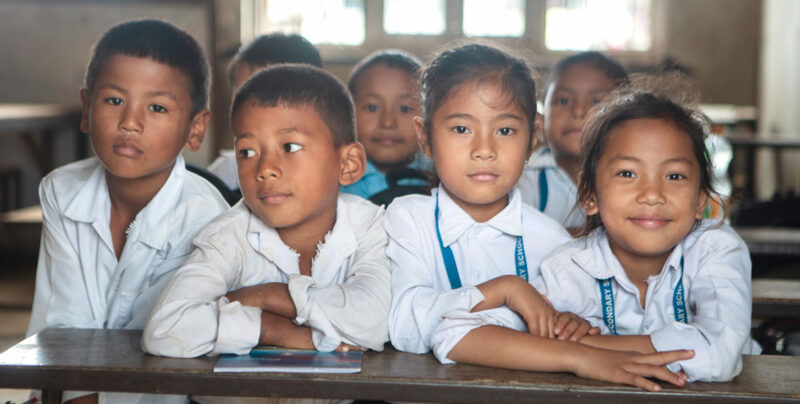 These kids have so much life and dreams running through their veins, and one day they’ll become men and women that will have a strong impact in their communities and will help to make it better. We get back to the hotel with our minds, hearts and souls full of feelings, emotions, moments, images and words. Too many to process now; it will take days, weeks, maybe months to really understand things. Suddenly the last day comes and with it the moment to say goodbye. They are going back to their lives in Italy and me and Alberto are staying to tell more stories. A veil of melancholy blows in the air. It has been an intense week with very few hours of sleep, we all pushed ourselves a little further than we thought emotionally, our hearts are whole and broken at the same time. This kind of trips are the most fulfilling, they’ll stay with you forever, they throw life at you and a perception of it you could’t find in many other ways, these trips change you. On the ActionAid’s office terrace we have one last chat, there are many tears flowing. I look at the supporters and I envy those tears, cause those tears come only from living a story and I know I’ll always want to tell those stories instead. But maybe you can live those stories through a lens or a pen too, cause I have their same tears of joy and nostalgia right now, while I’m writing these words, knowing I had the opportunity to be there for these beautiful experience that has been an important life lesson, but above anything else, a lesson of humanity. Thank you with all my heart ActionAid for this experience I’ll always bring with me. Thank you Vivian & Giorgia for putting it all together, thank you Paolo & Alberto for being my media dream team. And a huge thank you to the supporters for making me feel so many emotions through your stories. See you on the next adventure!